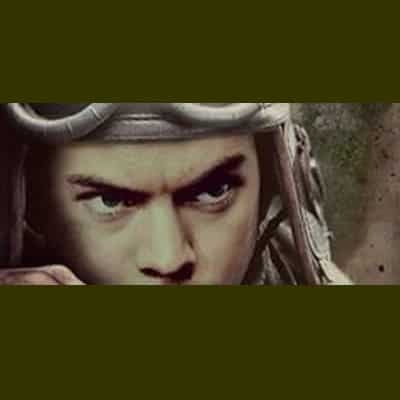 Yes, it is Harry Styles as Alex in Dunkirk. If you’ve not seen the Dunkirk movie don’t miss out, it’s an epic endless action film. Witness the true horror of one astonishing pivotal hour in the air, one brutal day on the sea, and one gruesome week on the beach during World War II, May 26 – June 4, 1940. It’s a segment of history, not shown as too bloody, but full of realism and powerful suspense that will make you quiver, make you think, not able to peel your eyes away, which beats struggling to see through nervous fingers as it brings World War II to life. Well worth viewing on the big screen. Tommy (Fionn Whitehead) – soldiers lining up on the beaches of Dunkirk. Director Christopher Nolan shot the film in large format photography applying painstaking detail such as utilizing some of the actual boats used in 1940, real planes and thousands of extras all adding to the suspense and stark reality of what transpired. The actions speak for themselves, whether plugging holes on a sinking ship, running for their lives, flying a British Spitfire selflessly battling against the enemy, making difficult decisions and forwarding the orders, or on a rescue adventure with a boat crammed with life vests. 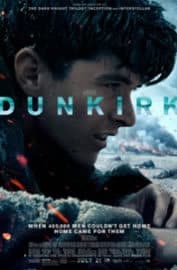 Worth mentioning for any doubters that Harry Styles wasn’t an extra, he played a soldier ‘Alex’ incredibly well and won the role after many readings and up against other well-known actors he was the chosen one as he was ‘fresh and interesting’ a key component for being selected for the part of one of the young and innocent soldiers as per Christopher Nolan. Similarly, with Fionn Whitehead another striking, rising star who played Tommy. Soldiers feeling briefly safe in the hold of a ship on the shores of Dunkirk. Thought-provoking for those just learning about the war, especially biting for those who lost relatives, it tells of the bravery, the agonising horror of war. It’s just one side a little bit of Britishness, you’ll be wanting a cup of tea after the many offerings, you’ll want to cuddle up to someone, you may shed a tear. It’s not out there to name and shame anyone it gives more a message of the waste of war, the heroes, the courage and the togetherness of a nation including those following orders and those who just took it upon themselves to be brave – whatever the consequences. It clearly shows there is no justice in war and that retreating is not cowardly, sometimes retreating means surviving – to win you have to first survive. Watching the sinking destroyer and the many soldiers trying to escape the ship their route to safety via the English channel. Some of the ‘little ships’ before being equipped with life jackets and fuel. On the UK Shores, all seaworthy ‘little ships‘ were brought into action to safely sale from Ramsgate, England (but they came mostly from around the South East of England) many were chartered and others, where owners could not be contacted, were simply taken by naval crews. in addition, many civilian crews simply set sail without their heroic actions being recorded to bring as many soldiers back from the tragic shores of Dunkirk in France. The larger vessels, the Destroyers couldn’t get close enough to the shallow shoreline, the flotilla of private boats over seven hundred in total were a huge asset to ‘Operation Dynamo’ which was named after the Dynamo room in the Dover Cliffs where the operation’s HQ was based. Operation Dynamo expected to be able to evacuate forty-five thousand of the BEF (British Expeditionary Force) within forty-eight hours, they did not anticipate that along with the call for additional naval vessels and ‘little ships’ and the mass evacuation of over two hundred-thousand soldiers via the eastern Mole (a long stone and wooden pier at the mouth of the port) Operation Dynamo enabled the largest military evacuation in history. After successfully saving 331,226 soldiers (British, French, Polish and Belgian) the UK Prime Minister – Winston Churchill made his famous speech ‘We Shall Fight On The Beaches.’ the film isn’t really political this wasn’t a key part of the movie at all. This film stays with you. The costumes were all made to specification from esteemed costume designer Jeffrey Kurland varied well-planned uniforms, premeditated to endure the action intended for, with thoughts on specific war time issues such as worn and outgrown uniform, oversized coats, and equipment such as gas capes which were carried at all times. Naval Officers and Commanders wore more bespoke tailored uniforms, even during the war they were expected to maintain a high standard, pilots seemingly wearing an array of layers, such as full RAF uniform over turtle neck jumpers with fur collared leather flying jackets. Besides the uniforms, there are a handful of civilian clothing on the screen that added a touch of more vibrant woollen colour to the sea of otherwise green and brown hues. Loved the knitted fair-isle vest/tank top that stood out worn by a young lad George (Barry Keoghan) as he boarded the little fishing boat, not really understanding what he was getting himself into he ultimately wished to show others how brave he was and to be part of the narrative however grim, the civilian crew father and son also adding a touch of colour with Mr Dawson (Mark Rylance) hurriedly adding a seaman’s jumper over his work shirt and tie readily willing to set sail and Peter (Tom – Glynn Carney) wearing a maroon, ribbed, turtle necked jumper out to sea. There is likely to be a trend this AW17 for many of these colours, textures and styles, certain similarities are already creeping on to the streets. 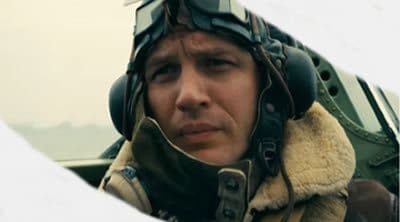 Director; Christopher Nolan Starring; Kenneth Branagh, Tom Hardy, Harry Styles, Mark Rylance, Kevin Guthrie, Jack Lowden, Fionn Whitehead, Bobby Lockwood, Aneurin Barnard, Cillian Murphy, James D’Arcy, Adam Long, Barry Keoghan, Elliott Tittenson, Brian Vernel and Charley Palmer-Rothwell. Dunkirk; DVD or Blu-Ray Now available on Amazon (affiliate link) great gift idea!